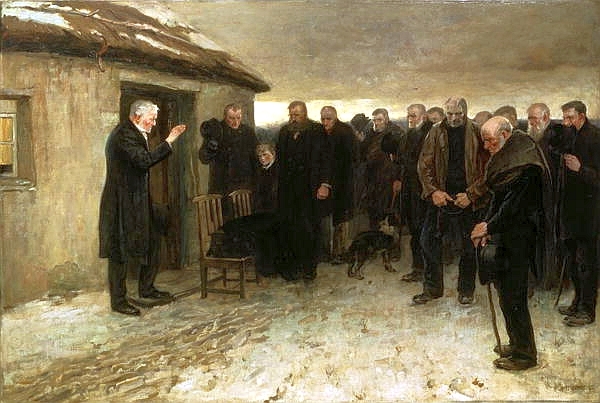 The traditional Irish Wake was commonplace around Ireland up until about the 1970's. This was the process of Laying out the body of a departed relative in the house where they lived and /or died. All of the family and quite a few of the deceased ones neighbors and friends would gather at the house. The body was usually in a coffin in the parlor of the house or living room. There would be lots of food and plenty of drink to be consumed. People would come and socialize and remember the departed person's life. This wasn't a time for tears to say the least; it was more of a party than a funeral. It was the traditional Irish way of celebrating one's life and ensuring that they had a good send off. The Wake is the period of time from death until the body is conveyed to the care of the church which is generally the evening before the day of burial. Neighboring women experienced in laying out the body gather at the house of the diseased. A habit is put on the body. A bed is prepared for the body. If the body is of a man - he has to be clean shaven before the habit is put on. A crucifix is placed on the breast and rosary beads are put in the fingers. Sheets are hung over the bed and along two or three sides. Candles are lighted in candlesticks near the remains. The women who prepared the body join the family. The mourning family produces either muffled sobs or loud wailing related to the depth of sorrow. In the event that the death was considered a “great loss” (a parent leaving a large family or tragic or early death) Keening is most intense and heartfelt. After a while of Keening mourners are led away from the bedside by a few neighbors and are consoled. Word is sent out to distant relatives and is spread with the help of a local shop or village. Preparation and then Keening does not wait for the arrival or others. If the person dies late in the evening the main Wake is not held until the following night so as to give neighbors and distant relatives time to attend. 'PREPARATIONS & REQUIREMENTS FOR THE WAKE'. Two men - a relative and a neighbor take part. The Coffin is ordered (traditionally made by a local carpenter at the Wake house). Supplies are brought in - bread, meat, food of all kinds. Whisky, stout, wine, pipes, tobacco, snuff. (Tobacco and snuff are extremely important as is alcohol). 'SET UP OF THE WAKE HOUSE'. A plate of snuff is taken to all for a pinch. A clay pipe filled with tobacco is given to all and all are provided with food and drink - traditionally a meal. Pipe full's of tobacco are offered. The place for the corpse is determined by the house itself. A table, settle or bed in the kitchen or one of the rooms is used. A loft may be used. The clocks are stopped as a mark of respect. All mirrors are turned toward the wall or covered. 'WATCHING THE BODY AND RITUAL OF VISITING THE CORPSE'. A corpse must not be left unattended for the entire Wake. A person, generally a woman or more sits nearby. On entrance, the mourner makes their way to the side of the corpse, kneels down and silently recites a few prayers for the departed soul. Mourner is then welcomed by the relatives and expresses sympathy. “I’m sorry for your trouble”...then the mourner speaks kindly of the deceased and then walks away. The mourner is offered food and drink for the hours spent at the Wake. If the weather is good the men congregate outside - if not, they go to the kitchen (this is very important and traditional). The corpse is often in the parlor and there is a division between the room of the corpse and celebration. The mourner stays for a few hours. The old men and women come in the morning and with the end of the working day others in the community stop in. The visitation lasts until midnight. The Rosary is recited once or twice - at midnight and then towards morning. The Rosary is lead by an important figure - teacher or leader who recites the first decade then the relatives take part. A truly traditional Wake will have a special rosary for the dead and traditional prayers. The rosary is said around the corpse with those around the house reciting the responses. Most visitors leave at midnight. Close neighbors remain till morning. They drink tea, whisky or beer and talk about general affairs. Anecdotes are told with quiet laughter but within a solemn and decorous mood. There are two funerals for the corpse; one in the evening and the second is when the body is taken to the graveyard on the next day.